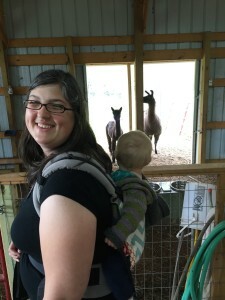 As you may know, my recent inspiration to get out and about in my hometown of Duluth, and to blog about it, was inspired by nostalgia for my study abroad days. 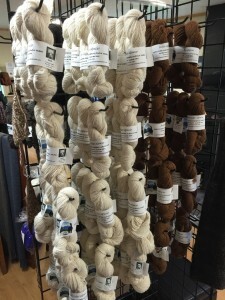 I not only missed getting outdoors and exploring gorgeous natural landscapes, I also missed fiber tourism, which, to me, is tourism focused on discovering the textile traditions and enterprises local to the place I’m visiting. 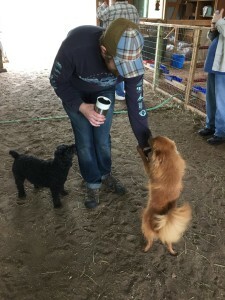 You can intentionally set out to visit fibery places, like sheep farms or weaving studios, but you can also engage in fiber tourism simply by keeping an eye out for pretty textiles, yarns, or animals while you’re out and about visiting other sights. 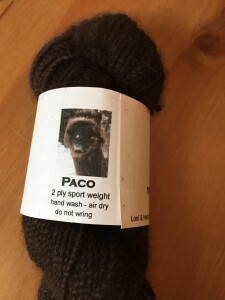 I spent 6 months studying in Buenos Aires, Argentina, and I visited a lot of ferias (markets) before I finally spotted some alpaca yarn at a vendor’s booth. She only had a couple skeins out, but when she saw my interest, she began to pull more and more yarn out of bags for me. It was a highlight of my time there. Less than a week after I had personally resolved to discover more of the local fiber arts things around me in Duluth, a flier showed up at Yarn Harbor advertising “National Alpaca Farm Days.” I sent a picture of the flier to Chris and said, “I found our plans for next weekend.” The flier advertised the address for Frosty Ridge Alpacas, a farm less than a half hour out of Duluth, but I also discovered this site where you can find a participating alpaca farm near you. 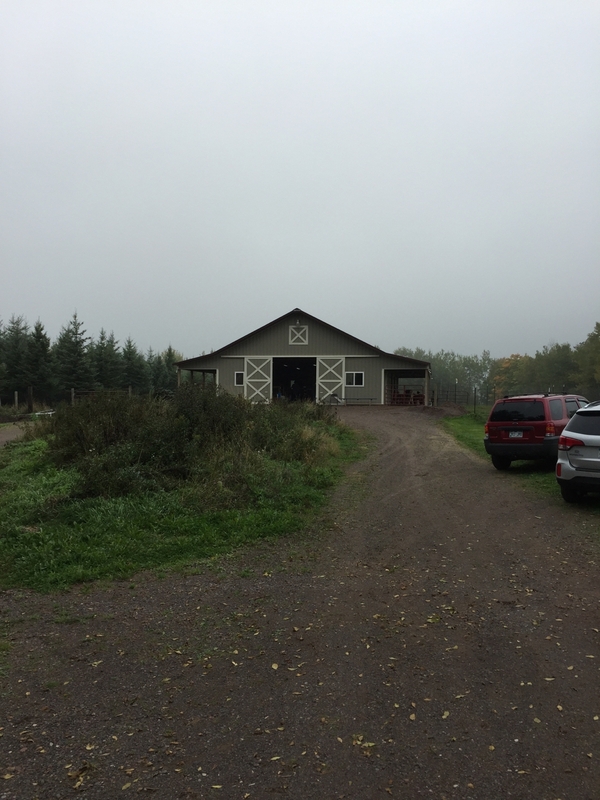 It was a bit of a dreary, foggy day, something I personally enjoy about Duluth. It’s great weather for knitting and coffee, my two favorite things. 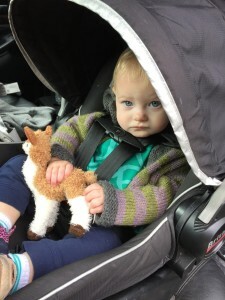 Before we headed out to see the alpacas, we stopped at Yarn Harbor to get some buttons for Astrid’s sweater. 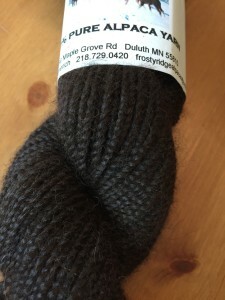 It was also, conveniently, the opening of the Three Irish Girls one of a kind trunk show and the revealing of two new Duluth themed colorways. They are named “The Deeps” and “Lester River Road.” They’re both deep earthy, tonal hues. I wish I had taken a picture! I didn’t buy any yarn yet, but I might have to. The one of a kind yarns were gorgeous too. They’ll be there until Thursday. After acquiring buttons, we stopped for coffee down the street at Amity Coffee. They also have really yummy banana bread. Coffee in hand, we headed up to the farm. It didn’t take very long to get there, possibly 20-25 minutes. 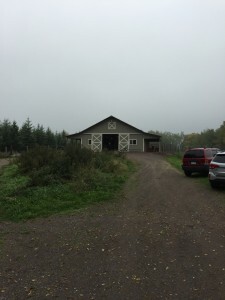 The farm had a tent set up with tables of food for the event, and there is a shop in the back of the farm house. We stopped in the shop first because it was closest to where we parked. The shop products made from alpaca fiber such as sweaters, socks, mittens, and, most importantly to me, yarn made from the farm’s own alpacas! There were also bags of fleece for spinning or felting. There were also toys, and Astrid was pretty cute about an alpaca doll wearing a little ear flap hat. When she smiled and hugged it, we couldn’t not get it for her. 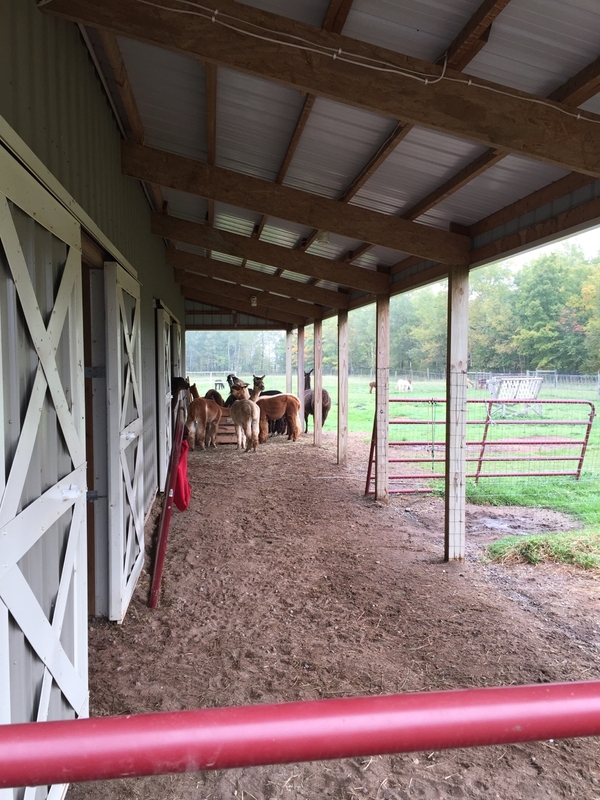 After a brief visit to the shop, we headed toward the barn to check out the alpacas! 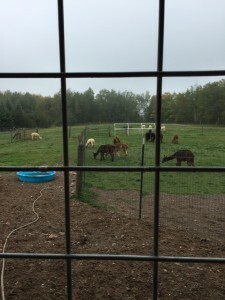 Most of the alpacas were outside in the field when we went in, but a few came curiously closer to us. I didn’t get any pictures of Astrid posing with the alpacas, but she did laugh and wave at them from her perch on my back. 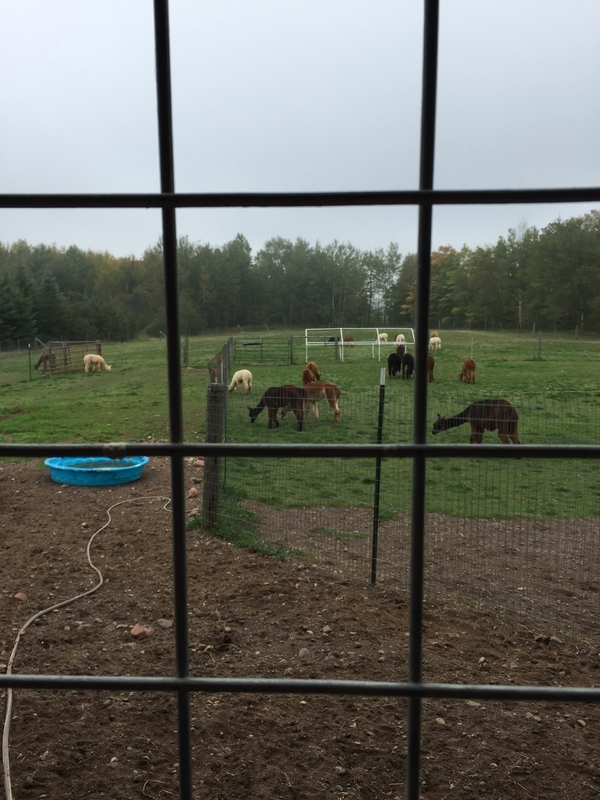 I think one of the animals in that picture is a llama, I heard the farm owner say that they have 32 alpacas and one llama. 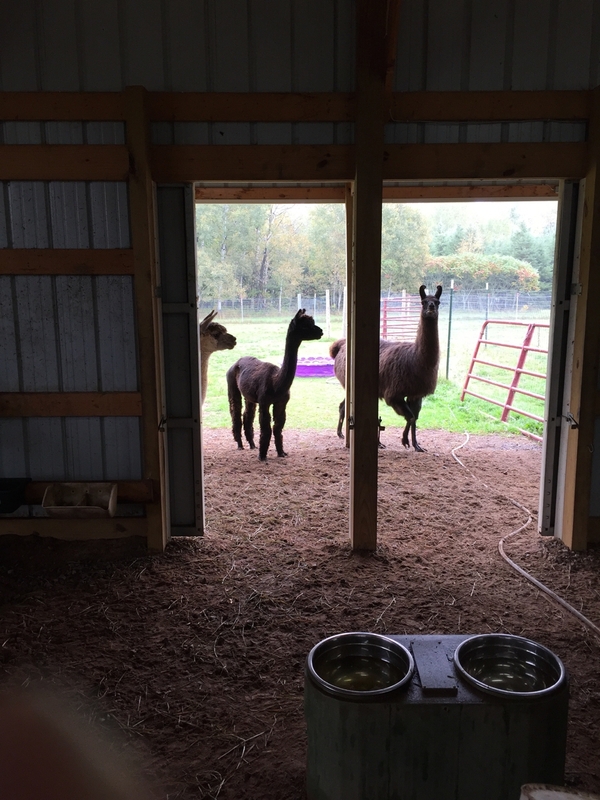 The llama protects the alpacas from predators, he said. Before we left, we went back to the shop and made our purchases. I got a skein of yarn from the alpaca named “Paco.” The labels on the yarn include a picture of the llama that the fiber came from. Once I can knit again, I think I will turn it into a very soft, warm hat.